Crann Bethadh is Tree of Life in the Gaelic language and in Celtic folklore trees are the source of all life and creation. The ancient Druids believed that two hidden eggs hatched from inside a willow tree; one of these brilliantly colored scarlet eggs produced the sun and the other formed the Earth. The Celtic spring festival of Beltane on May 1st marks the beginning of the light half of the year and it incorporates the legend by painting eggs as one of the activities. Eventually Christians adopted the practice of coloring eggs at Easter. Beltane also celebrates the mighty oak tree as the specie that is associated with the light half of the year when the leaves have returned to the deciduous trees and there is plenty. The ancient Celts considered the sacred oak to be a source of strength and it is from doire, its name in Gaelic, that the strength knot, the Dara knot, originated. The Dara knot represents the root system of the mighty oak and that we too have hidden strengths that we must use during challenging times. The Druids noted that it is the oak that is most likely of all trees to be struck by lightning, yet once stuck, it continued to flourish. The Celtic winter festival of Samhain is celebrated on October 31 through November 1 and it marks the start of the dark half of the year on the Celtic calendar. This dark time of the year is associated with the holly tree, that like the oak is defiant of lightning strikes as its prickly evergreen leaves allow electricity to pass through. Subsequently it was often planted adjacent to structures and homes to guard against lightning strikes. Celtic lore understood that bringing the foliage of the holly tree inside during the winter would provide sanctuary from the cold for the wee fairy folk, who in return would be kind and protective to the human inhabitants. This practice evolved into the Christian Christmas ritual of decorating the home with holly or accenting your front door with a holly wreath. The Ash is another of Ireland's sacred trees as it is known for its strength with its wood prized for boot construction and in modern times for hurling sticks. The Druids considered the ash tree to have magical properties and later Irish immigrants would bring a piece of ash wood as a charm against drowning during their travel to new lands. According to Christian lore, St. Patrick used a staff of ash wood to banish the snakes from Ireland. The ash is a large tree that will obtain heights of 130 feet with a massive root structure. 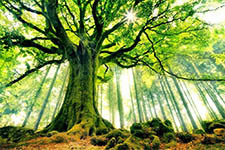 Due to these proportions the Celts referred to ash trees as the Tree of Life that spans between worlds and was considered the backbone of the creation. Celtic mythology also held the yew tree in high regard as it is associated with longevity along with immortality. The yew can often live in excess of 2,000 years and it has an interesting way of regenerating itself by directing its branched to grow downward to the soil which in turn from new trees that would often wrap around the original. The ancient Tree of Life symbol has been preserved in Irish culture; thus The Irish Gift House is proud to present an assortment of Irish made Tree of Life jewelry that includes Tree of Life necklaces along with earrings and charms. We additionally feature a section of Tree of Life gifts that includes items that range from plaques to money clips with many eclectic selections in between.